I have never owned a mini muffin tray. Always wanted one but didn't like how the trays are tiny with only 12 holes so you have to buy 2 trays or be stuck baking batches for hours. Combine flour, cocoa and sugar in a large bowl. Whisk together butter, egg and milk in a separate bowl. Fold wet ingredients and chocolate chips into dry ingredients. Do not over-mix. 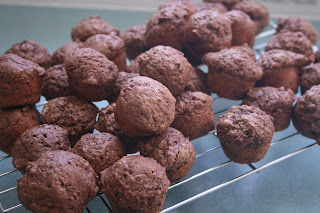 Bake in moderate oven for 20 minutes (or for mini muffins, around 12 minutes). trouble is toni you eat twice as many when you make mini ones, trust me i oveer did it today ;)!! the trouble with the small muffins toni is that you eat twice as many! Love this receipe. although kind of wish i hadnt tired it as i am going to end up making ( and eating) this a lot!